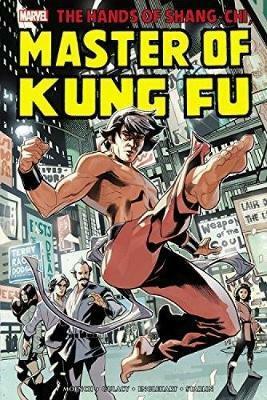 Re: "Shang Chi, Master of Kung Fu" comic series to be reprinted starting Summer 2016! 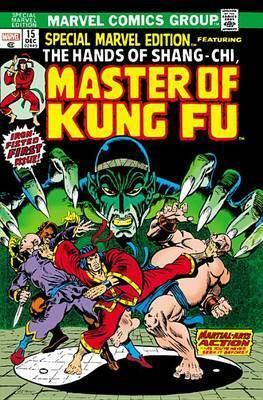 I'm in for Master of Kung-fu omnibus, and I already have it on pre-order, but I'll be skipping Deadly Hands. Hmm, so no Epics or whatever? I guess I wouldn't be surprised considering the rights battles. So maybe I will wind up getting them all. I'm just going by what Cory Sedlmeier (the editor on these books and the point man on Marvel's Masterworks volumes) has posted over on the Marvel Masterworks forum. I haven't seen anything specific, but he has strongly suggested that if you want this material, now is the time. I think the fact that they have planned out and announced all volumes in advance tells us that this is more or less a limited time deal. I should hang out on the MM board more often. Great info, but the forum software seems even more antiquated than here. That board's software feels like a time travel trip back to the 1996 Internet. Because it is from 1996. It's still the same old format and design of the old EZBoards that existed from 1996 until 2005 when it was re-branded (maybe purchased by another company?) and called Yuku, but nearly all of the EZBoard stuff was converted over. Their method of data storage was so antiquated that they had a big crash and lost years worth of data from many long running message boards. I think they may have upgraded their backend software and databases over the years, but the designs of EZBoards/Yuku essentially remain the same for those who still use them. Ordered my copy of the variant cover at IST for six bucks extra! I don't normally sell my omnibuses. For anyone more in touch with the market, does a variant cover on an omnibus add any additional value down the road? I have noticed that sellers on eBay frequently mention if the item has a variant cover or not. There's less copies of the variant covers, so yeah, they tend to be valued a bit more. It depends on the book and cover in question. If the omnibus is highly sought after on the second hand market and commands high prices across the board, the variant usually doesn't sell for any more than the standard. The Wolverine omnibus is one such example. That's also a case where the variant is the modern cover, while the standard is the classic. I find that the classic variants are the ones that usually command higher prices. The old Miller Daredevil omnibi were the best example. Those also had the standard covers which were like half covers, which is another reason the variants sold for so much. At the very least, the variant is never going to be less valuable than the standard. Except in the case of that awful Agents of SHIELD tv variant on the Lee/Kirby/Steranko SHIELD omnibus. What a piece of garbage that one was. Thanks for the info about variants. In general, I like the classic-issue covers. In this case, the standard cover looks washed out to me. IST is selling the standard one for 50% off, while the variant is 45% off and limited to one per customer. Wait, what was the issue with SHIELD? I got the Steranko cover. Was that the wrong choice? Wow, that is stupid. The show and the book have zero in common, except for their title. Wow, that is total crap. IST was blowing those SHIELD variants out for like $35 a few months back and I still refused to buy it. And generally speaking, I couldn't care less about cover art on books/dvds/etc. So just to clear up a bit of confusion, I also ordered the Starlin Variant, which is the classic cover edition, correct? For $35, I may have bought it and just tossed the dust-jacket. Cover underneath should be plain with just the title, right? Yeah, if it was a book I was more interested in owning (and I wasn't actively trying to limit my omnibus purchases) I probably would have pulled the trigger. As it was, I came very close, but the stupid cover convinced me to refrain. That's the original cover for the first MOKF story. It depends. More Omnibuses now are printed with art covers, with less getting the plain covers. Sometimes it's the same as the dust jacket art, sometimes it's the variant dust jacket art, sometimes I think it's just logo design. So in some situations you can get the best of both worlds with the both the standard and variant covers, it's just that one will be printed on the actual hardcover. I don't know the situation with the SHIELD Omnibus though. I got this (Starlin cover), and even though I got it for 45% off cover price, it's cover price is $125, which is really high, as this isn't that big of an Omnibus. It definitely should've been a $100 Omni. Slop, the Starlin cover sold out so while it was a bit pricey this book should retain its resale value. I am certainly glad I picked up a copy. Edited to add: I just realized that saying the variant sold out is not quite true...Amazon will have some copies, but at a much higher price point (it was $110 the last time I checked, and I suspect the discount will not increase all that much, if at all when it is in-stock). Last edited by Inhumans99; 06-08-16 at 07:06 PM. $125 seems to be the new normal for this size of omnibus. It would be the first one of it's size at that price. It's only 700 pages, vs every other $125 omni that's over 1,000 pages. 1. As far as I know the artwork was completely digitized and restored for the first time, unlike other omnibi which generally re-use the files from previous collections. 2. There were licensing costs related to the use of Fu Manchu (and other characters) that obviously don't apply to other titles.